This is The LOOK that EVERYONE wants! Now we are offering our retro look at the PRICE that EVERYONE wants! 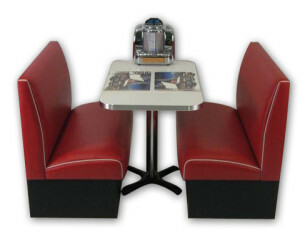 Our Americo Diner Booth set is comprised of two fully upholstered benches, with contrasting piping. The table is laminated in white and has 1.25″ real metal banding, and a classic chrome column base. Available in Red/White, Teal/White or Black/White only. Table tops available in White, Red or Black. Over the years, I bet many of you have enjoyed a milkshake or burger at a set like this in an “old fashioned” drug store or eatery in your home town. You won’t find it cheaper, or at this quality! Table and Countertop real metal banding for that retro look. Available in 1.25" and 2.25"